Let the stress of everyday life melt away as you unwind and relax in your own private cabin right on Lake of the Woods. Luxury in the wilderness surrounds you, topped off by a stunning backdrop of sparkling water, pine trees and blue sky. This is a first class fishing adventure – with top of the line 19.5 foot Triumph Cruisers, are the best on the lake. The boats are guided by one of the top professional guides and come fully equipped with depth finders, GPS, 2-way VHF marine band radios, navigational lights, nets, paddles and all boat safety equipment. After a morning of reeling in fish after fish, its shorelunch time! Sit back and relax on your own private island on the lake, while your guide does the rest. Fresh fish, famous potatoes, baked beans and dessert await you. Cooked over an open fire in the wilderness, a shorelunch is a TRULY CANADIAN experience! 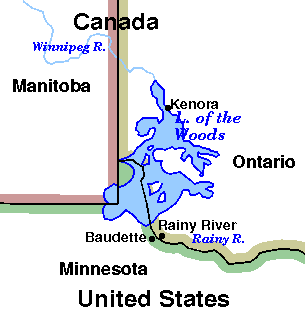 It is no secret that Lake of the Woods is a huge area of untouched, natural wilderness. With over 65,000 miles of shoreline and over 14,000 islands – everything you need for a successful trip. Deluxe cabins are unrivaled, complete with outdoor decks, stunning lake views, air conditioning, satellite telEvision, microwaves, many with full kitchens and fireplaces! Rang- ing from 1 bedroom/1 bath to 6 bedrooms/7 bathrooms there is a room for everyone.